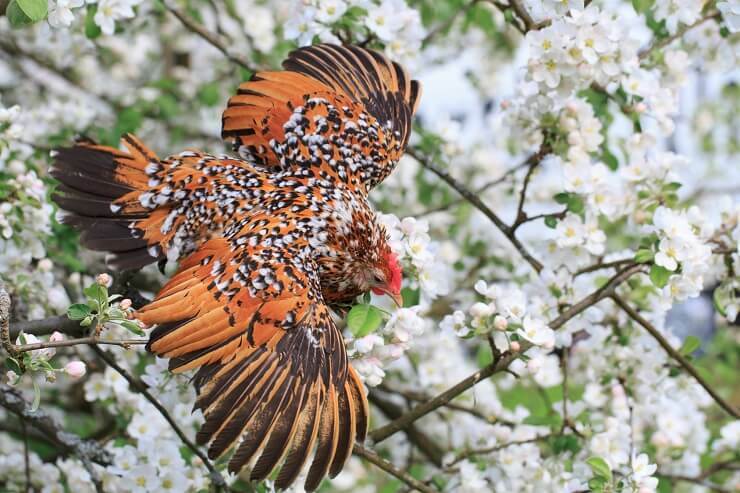 Chickens don’t come any cuter than Belgian D’Uccles – but I am biased of course! If there were only one breed I could keep, they would be it. Also known as Barbu D’Uccles, these pint-sized birds have personality by the bucketful, they love your company and will often fly up to your arm or shoulder to sit there and chat with you. D’Uccles’ are true bantams meaning there is no large fowl counterpart for the bird. In this article we discuss their temperament, egg laying capabilities and how to care for them. We also discuss the most popular varieties including the Mille Fleur. Simply translated, the name Barbu D’Uccle means: ‘bearded’ from the area around Uccle in Belgium. The credit for creating this breed goes to Michael Van Gelder, a rich Dutch businessman. He started on his quest in the late 1800s and spent several years, and lots of money, to perfect his vision. He was assisted in his quest by Robert Powels. The breed was first shown in 1905 and quickly became a very popular little bird, crossing the ocean to England and the US quite rapidly after its’ introduction. How Mr. Van Gelder created this bird has been the subject of speculation for many years now. It is thought that he crossed the Barbu D’Anvers (Bearded from Anvers) with the Dutch Sabelpoot (vulture hocks), whether or not there is any other genetic material is unknown. These various types of landrace birds were exhibited in Germany and England throughout the 1800s. Perhaps these ancient landrace birds are where Mr. Van Gelder got his chicken idea in the first place. Starting at the head, the D’Uccle has a single comb and red/orange eyes. Each bird should have a muff and beard which extend around the head, giving the appearance of an ‘owl head’. The ladies have very small or non-existent wattles; beak is horn colored. The neck is short but well developed, running down into a broad body. The breast also is broad and well developed. The skin is white. The tail is held at a perky angle, almost perpendicular to the body. Their legs are set well apart and are short, strong and feathered. There are four toes with the outer toes being feathered. The bird sports vulture hocks which point down and sweep to the back of the bird adding quite a flare to this lovely little bird. Feathers are a rich red/brown almost mahogany base with a black iridescent crescent band in the mid feather region. The tips of the feather are reminiscent of a white half-moon. Boys weigh in at 26oz, with the ladies weighing 22oz. 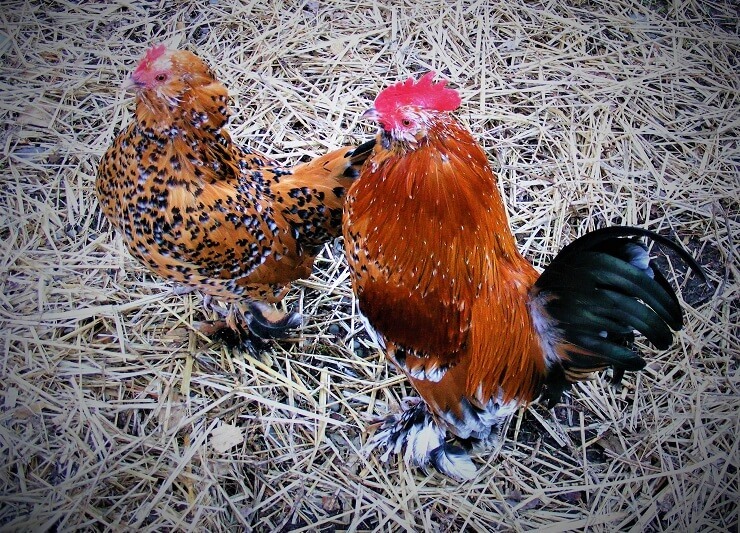 They are often confused with ‘booted bantams’, but these are two separate breeds completely. While the D’Uccle has beard, muffs and boots, the booted bantam only has the boots. Once you have seen them together there is no mistaking one for the other. There is also a rumples variety of D’Uccle called the Barbu D’Everberg which is not quite so popular, in fact it was extinct after World War 1 and was fairly recently recreated in the 1970s. The Poultry Club of Great Britain recognized the D’Uccle in 1910. It is classified as a Belgian Bantam. 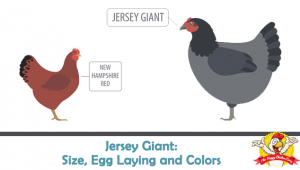 The American Poultry Association recognized the D’Uccle in 1914 and classified it as feather legged. The American Bantam Association recognized the variety, classifying it as single comb, muff and beard. The ABA recognizes the following colors: black, white, blue, buff, grey, golden neck, mille fleur, mottled, porcelain and self-blue. There are several more colors available in Europe – blue, quail, cuckoo and silver quail being three of note. In Belgium there are over 20 different color varieties recognized. These are delightfully cheerful and talkative birds. My rooster runs a constant commentary when he is roaming the yard with his harem. The rooster crow is a bit high pitched, so if you have neighbors they may find the crowing annoying. They will frequently fly up to your shoulders or lap and sit chatting away for ages. Most of them enjoy being picked up and held and will sit contentedly in your hand, even taking a nap there! The roosters can get a little feisty in the mating season, but for the most part they are not aggressive or mean to their girls or keepers. 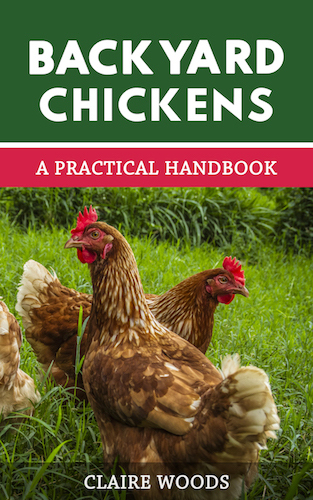 Since they are bantams, if you have a flock of assertive standard sized birds, you might want to keep an eye out for bullying, especially when they are chicks. They are good flyers, so if you want them confined you will have to cover your run otherwise they will be all over the place. If you plan to keep their run covered, make sure they have plenty of space and things to occupy them. Although they are not renowned for fabulous egg laying abilities, they do put out between 150-200 small, white or tinted eggs. They are late to start laying in spring, but keep going through the winter. They are known for being broody, although not all D’Uccles go broody. Those that do, make great mothers to any chicks. They will sit devotedly on the eggs until they hatch and then tend to the chicks regardless of size or type. No major health issues of note, although all feather footed breeds can be subject to scaly leg mites. Ensure you check the legs frequently for any signs of trouble. Since the D’Uccles have so many facial and leg feathers it is wise to keep a close eye on them in the warmer months for any signs of lice or mite infestation. They have a high metabolic rate, so they don’t like the cold very much at all. Mine do well in winter, but their coop is inside an old barn so they are well protected from the elements. A stand-alone coop in a cold climate would benefit from some insulation for the bitterly cold months. You should certainly make sure there aren’t any icy drafts whistling through the coop and that the interior is dry. The feathered feet always look worse for wear if they walk around the yard through mud etc. If you are going to show these birds, you will need to keep them on a surface that will not discolor or break the foot quills – sand is a good surface for this. 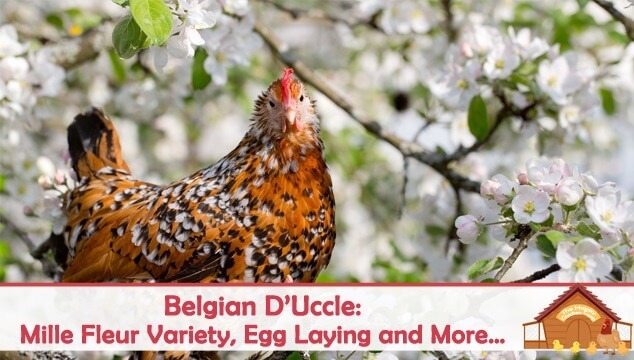 Is The Belgian D’Uccle Right For You? The D’Uccle Mille Fleur is a beauty to behold. Their plumage seems to sparkle in certain lights; they make very pretty ‘lawn ornaments’. In fact, a nickname that they earned at the turn of the twentieth century was ‘living flowers of our gardens’. They are a great bird for kids to be around as they love to be petted and held. 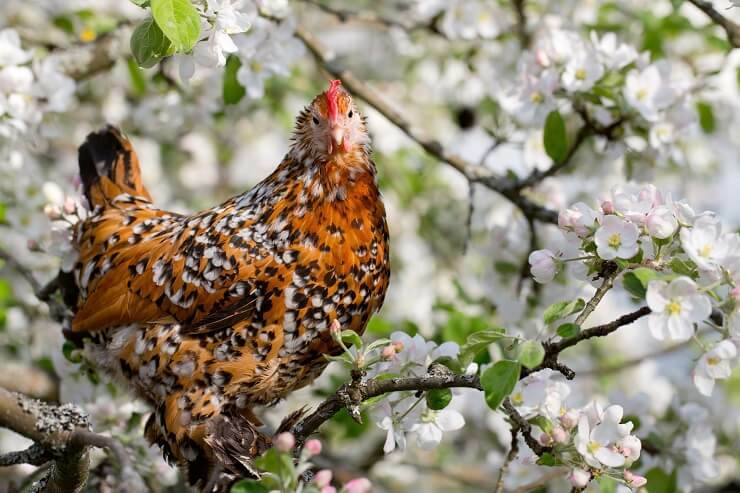 It is really an ornamental breed since the eggs are quite small and the bird is too small to be considered a meat breed. The calm, placid nature of the bird lends itself to shows and exhibitions, even the boys! Each bird has a slightly different variation of plumage pattern so no two look alike. If you enjoy a bird that loves to be interactive with you, the D’Uccle may be it. They like to talk, sing and trill (especially if they have an audience). The D’Uccle is a lovely little bird to have in your flock; I would not be without them. They are comical to watch as they patrol the yard; their feathered feet give them something of a ‘Charlie Chaplin’ way of walking. They will chatter to each other continually and will keep close to you if they think you have treats. My D’Uccles live with the main flock and although there is the occasional brief skirmish, they manage to avoid the bigger girls by flying up and out of the way. The fact that they lay through the winter has been a really good thing. When most of the other girls are resting, the bantams are busy laying and have kept us in eggs for the last few years. Their broodiness comes in handy if you have eggs you want to hatch. Once they are in the mood just slip them under her. They will usually accept eggs and sit contentedly until hatching. I have one little girl, and yes, she’s so adorable and loves to be petted. Wish I could have more, but my community has a limit on how many I can have. I’ve just hatched my first ever d’uccles, three black mottled girls, and they’re adorable! Only 12 weeks old and not very sociable yet, but they do chatter away. I didn’t know they lay through winter so that’s a nice bonus. Hoping to hatch more colours next year since they’re very hard to find where I live. We have had a population explosion. We went from 11 adult belgians to now 44 strong flock. But one of my 5 week old chicks is about 1/4 the size of the others. Even the 3 week olds are now bigger than her. I call her Sweet Pea and I was wondering if she will be alright. She feeds and drinks okay but I am wondering if I should separate her from the flock and raise her myself. Any ideas? I just received six little ones in the mail from cackle hatchery! They are super cute! Very excited to add them to my flock of cochins. Really enjoyed reading your article about them.